A number of people view the cloud in all or nothing terms – you move everything to the cloud or you leave everything where it is. The reality is that a lot of cloud adoption is going to follow the hybrid approach using both on-premises and cloud services. An example of this hybrid approach is Windows Server “8” which gets better when you connect it to the cloud. Today’s blog by Gaurav illustrates that by describing the Microsoft Online Backup Service, a new cloud based service for Windows Server “8”, which backs up your server’s data to the cloud so that it is safe and secure. That means that you no longer have to figure out where to store your backups so that they are safe. The cloud does that for you. This is an extensible model so it provides a great opportunity for partners to provide cloud backup solutions as well. The Microsoft Online Backup Service is a cloud based backup solution for Windows Server “8” which allows files and folders to be backed up and recovered from the cloud in order to provide off-site protection against data loss due to disasters. The service provides IT administrators with the option to back up and protect critical data in an easily recoverable way from any location with no upfront hardware cost or resources other than an Internet connection. This service is built on the Windows Azure platform and uses Windows Azure blob storage for storing customer data. Windows Server “8” uses the downloadable Microsoft Online Backup Agent to transfer file and folder data securely and efficiently to the Microsoft Online Backup Service. Once installed, the Microsoft Online Backup Agent exposes its functionality through the familiar Windows Server Backup interface. Get a free beta Online Backup Service account (with 10 GB of cloud storage). In order to request access, please sign up to get an invitation to the service at http://connect.microsoft.com/onlinebackup. Please note that there are a limited number of customers that we can support during the beta and we will grow our capacity over time. We have available slots right now so if you are willing to give us feedback, sign up now to try this great new service. Download and install the Microsoft Online Backup Agent. The agent installer download is located on the Microsoft Connect Site indicated above. Simple configuration and management. 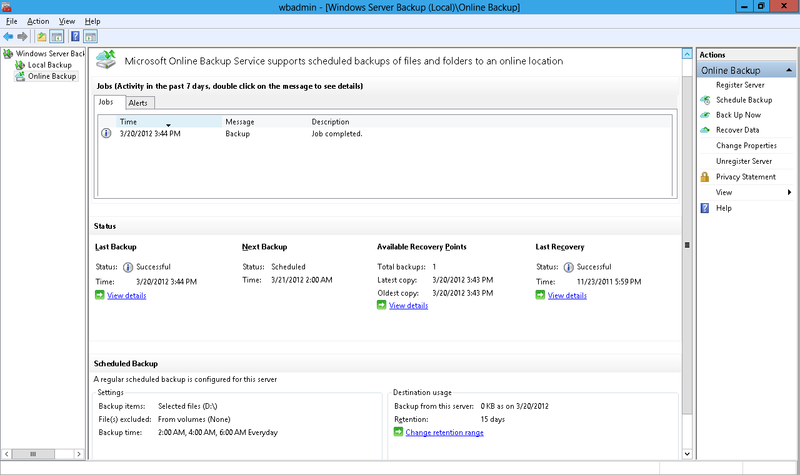 Microsoft Online Backup Service integrates with the familiar Windows Server Backup utility in order to provide a seamless backup and recovery experience to a local disk, or to the cloud. The Microsoft Online Backup Service only supports the Windows Server “8” operating system. It does not support Windows 8 Consumer Preview client operating systems or any Windows operating systems released prior to Windows Server “8”. 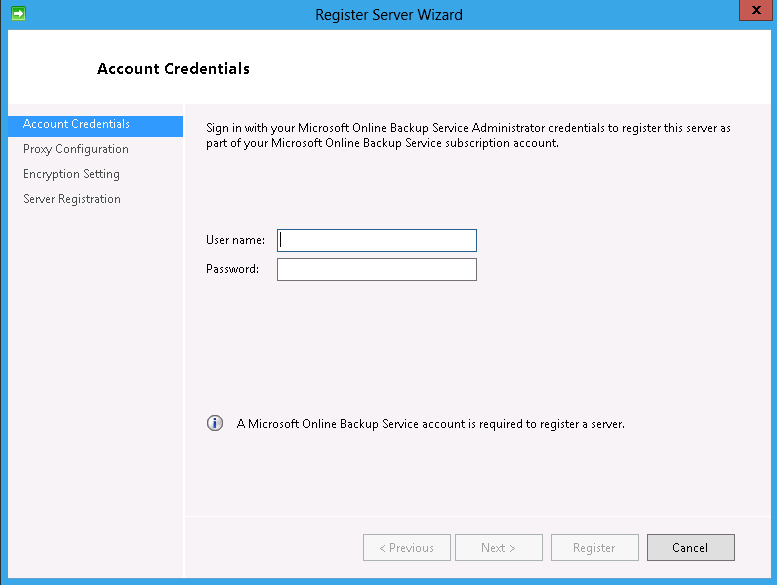 You can choose the Register Server action in the Microsoft Online Backup MMC snap-in to start the registration wizard, and sign in using a pre-provisioned Microsoft Online Services ID. 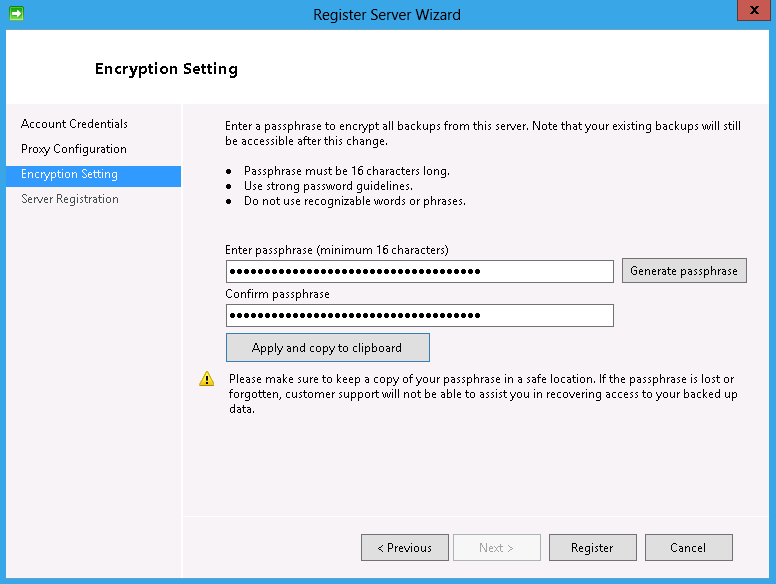 You also need to set the passphrase to encrypt the backups from the server. The following code sample illustrates how you can use Windows PowerShell to register a server with Microsoft Online Backup Service after establishing variables to use to supply your credentials. Once the server is registered you then need to use the Set-OBMachineSetting cmdlet to specify the encryption passphrase. 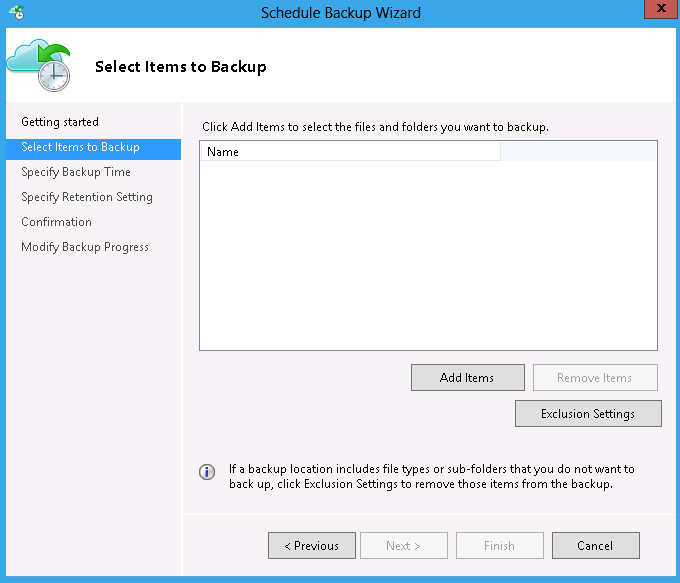 You can choose the Schedule Backup action to start the Backup Schedule Wizard to set the backup schedule in which you specify what files and folders you want to backup, how frequently you want to backup and how long you want to retain the backups in the cloud. 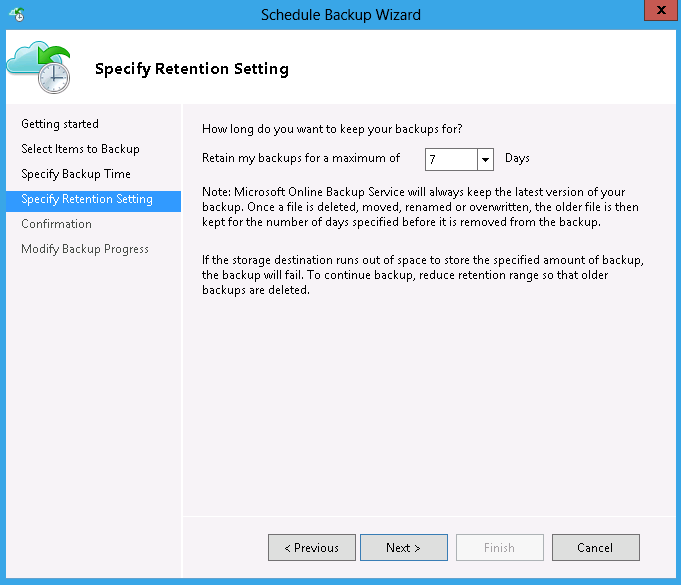 To start a new backup from within Windows PowerShell, administrators need to define a backup policy, the data locations, the schedule for the backup job and the data retention policy for the backup policy. The following commands will setup variables for a basic backup job within Windows PowerShell. The Windows PowerShell script will create a new Microsoft Online Backup Service policy named $policy that will back up all of the files and folders in the C:\Windows\Logs directory. The backup policy runs on Wednesdays at 9:30 AM and will keep the data in the backup for a period of 30 days. These commands put all of the previous variables into the $policy Microsoft Online Backup Service policy object so that it can be run at the next scheduled time. If this is the first backup on the server after registration, the encryption passphrase must be set. After configuration of the backup schedule is completed, backups will occur as per the configured schedule. You can choose to invoke manual backup using the Backup Now actions in Microsoft Online Backup MMC snap-in. 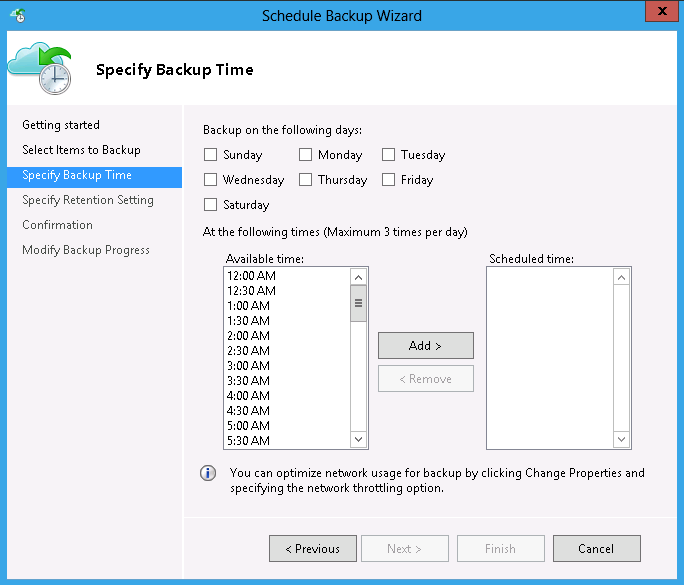 Backup Now runs the schedule immediately and the backups include only currently selected items. If you want to backup additional files or folders not included in the original schedule, you will need to modify the backup schedule before using Backup Now. 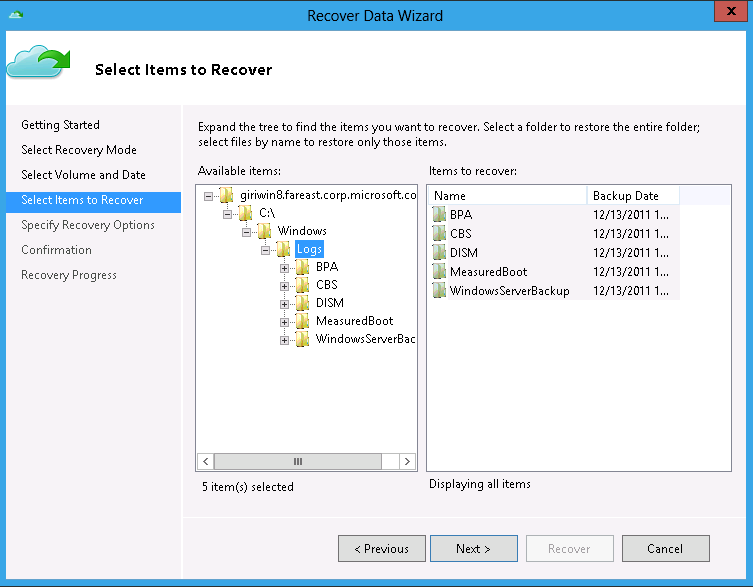 To recover data using the Microsoft Online Backup Service feature, click the Recover Data action in the Microsoft Online Backup MMC snap-in. 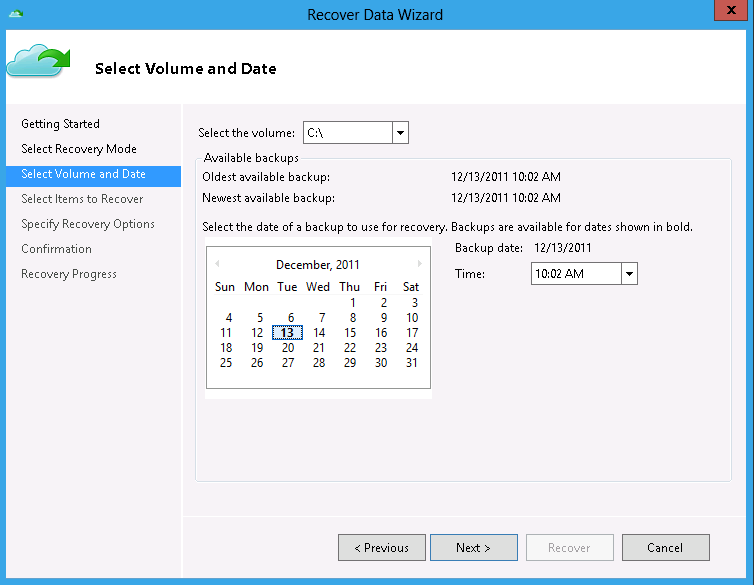 As part of the Recover Data Wizard, you can choose the volume from where data needs to be restored and the date and time of the data to be restored. After selecting the date and time, you are presented an explorer view of the data which is backed up from where you can then select the items that you want to restore. The Microsoft Online Backup Service gives IT administrators a powerful but simple option for off-site data protection of their critical file and folder data on Windows Server “8”.